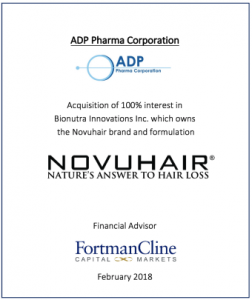 Fortman Cline advised the Pascual family in the acquisition of 100% of Bionutra Innovations Inc.
Fortman Cline advised the Pascual family in the acquisition of 100% of Bionutra Innovations Inc., the owner of the Novuhair brand and formulation. This acquisition expands ADP’s business into consumer wellness and cosmetics. This entry was posted in Firm News on February 21, 2018 by FortmanCline.